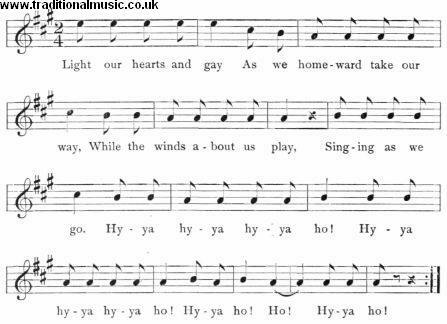 Light our hearts and gay As we homeward take our way, While the winds about us play, Singing as we go. Hy-ya hy-ya hy-ya ho! Hy-ya hy-ya hy-ya ho! Hy-ya ho! This song should be repeated many times as all the dancers, with rhythmic, springing steps, wind about the camp ground before they finally disperse.